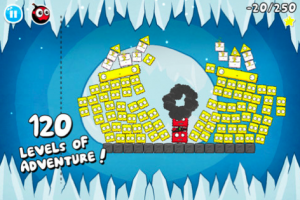 The comparisons between Drop Out and Angry Birds are just begging to be made, so we’ll just cut right to the chase. 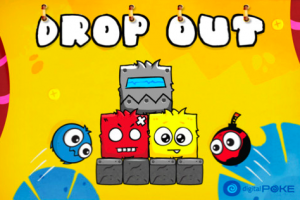 Drop Out may not be quite as addicting as Angry Birds, but it is a very fun game with a style and experience that is all its own. The game features 4 different “worlds,” each with 30 timed levels. 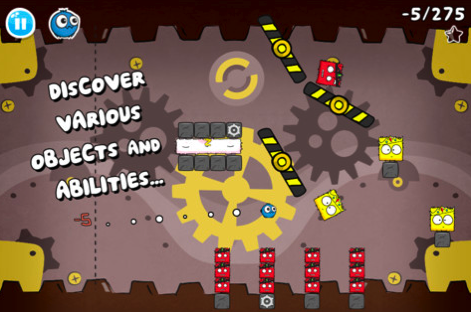 These worlds include a spaceship, an ice cave, and the cog works. 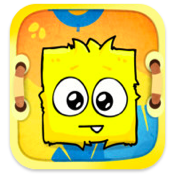 In each, you must use tiny little balls of anthropomorphic fluff to topple stacks of yellow bricks and shapes. The menu music is great: sort of a cross between calypso and old school Mario games. Very catchy, but not so much that it drives you nuts. The fuzzlings themselves also chatter quite a bit: expect purrs, laughter, “wheeees,” and other goo-goo ga-ga nonsense noises that are surprisingly cute. But with all the chatter during gameplay, you may want to silence the sound for the sake of everyone else’s sanity. The game can be played with a single finger, with your other hand occasionally needed for canceling your trajectory or executing special attacks. 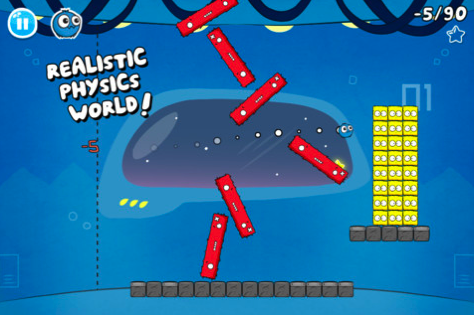 Mastering the controls is pretty easy, but there is a bit of a learning curve in terms of the physics of the game. Tapping on each yellow block will reveal the point value for each shape, helping you to strategize the best way to rack up enough points to clear the level. What is best about the game, however, is the level of difficulty. 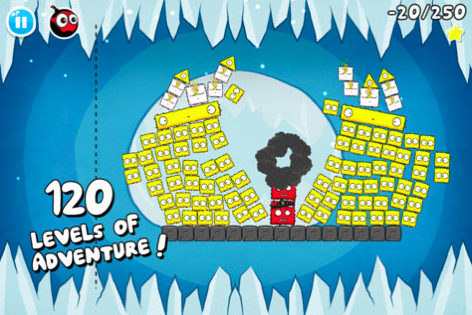 The timer and the scoring system really push the player to do their best and beat their past high score, and the puzzles are not easy to work though the first time through. The presentation of the blocks is unique, and if you aren’t hooked by 1-8, I’ll eat my hat. Drop Out is an unassuming little game that offers a lot more than the average Angry Birds-like app store experience. If you love physics puzzles, cute sounds, and challenging setups, this little app is certainly worth one of your hard-earned dollars. Drop Out is Compatible with iPhone, iPod Touch, and iPad. Requires iOS 4.3 or later. A small expedite fee was paid by the developer to speed up the publication of this review.